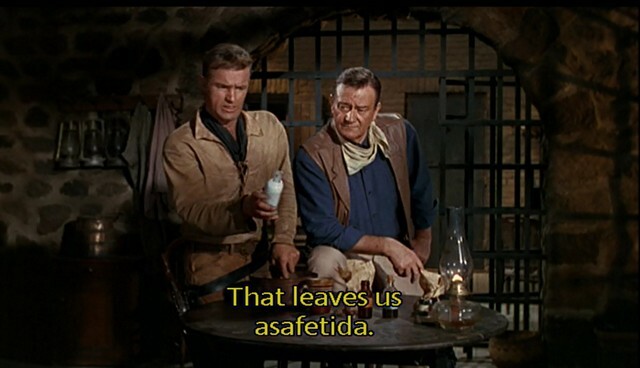 Examining the Hangover Cure in the Western “El Dorado”: Was Asafoetida Known in the Old West? For some forgotten reason, I recently watched the 1966 Western El Dorado. It’s one of the better Westerns I have seen, with more humor and a lot less racism than the typical Western (though there’s a short cringe-worthy stereotyping of a Chinese person near the end). The film has a top-notch cast and crew: the great Howard Hawks directing, John Wayne playing a roving gun for hire, Robert Mitchum as a troubled sheriff, and James Caan as a mysterious man from the South with a mysterious grudge (they call him “Mississippi”). The performances are engaging: John Wayne is in full “John Wayne mode” but not over the top, Mitchum gives a laid-back performance that feels more 1960s than 1860s, and Caan is enthusiastic in his supporting role. Like many Westerns, the central conflict is access to water: a big rancher wants to take a family’s water. 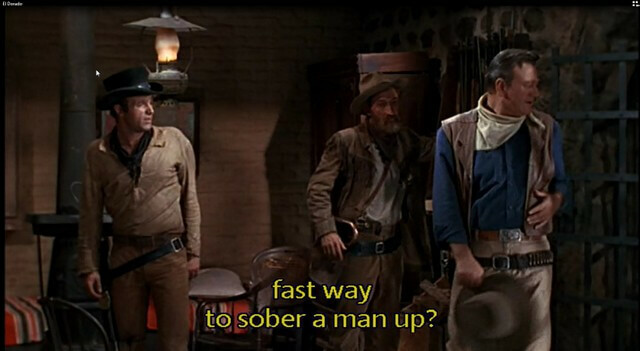 The town sheriff (Mitchum) recently had his heart broken by the main female character and has been drowning his sorrows in a lot of alcohol, so he can’t help in the battle for justice against the nefarious rancher and his goons. But when things get really serious, the sheriff needs to sober up. Mississippi suggests a sure-fire potion to free someone from alcohol’s grip that has a bunch of odd ingredients, including asafoetida (full recipe at Booze Movies). When I heard Mississippi say “asafoetida”, I was quite surprised. It’s something that I completely associate with Indian cooking and not at all with the United States in the 19th century or medicinal use (to be sure, that’s a subject that I’m ignorant about). So I started wondering: Was it put into the script because the word “asafoetida” has an exotic sound that makes it a perfect ingredient for a quack remedy? Or was this ingredient actually known in the U.S. in the late 19th century so that Mississippi could have run across it (in his fictional life)? Screen capture from El Dorado with subtitle. L to R: James Caan as Mississippi, Arthur Hunnicutt as Bull, John Wayne as Cole Thorton. The drunken Sheriff (Robert Mitchum) is locked in the jail cell. Screen capture from El Dorado with subtitle. The heroes mix up Mississippi’s special potion. Leigh Brackett wrote the screenplay using Harry Brown’s novel “The Stars in their Courses” (1960) as source material (Brackett’s screenwriting credits include Rio Bravo and The Empire Strikes Back; Brown’s credits include Ocean’s Eleven, A Place in the Sun). With some difficulty, I was able to find a copy of the novel in the UC Berkeley system. I got about 30 pages into it and I saw little resemblance to the film. The novel is set in the old West, there are feuding rancher families, but there’s no sheriff, and only one of the main characters appears (Maudie). Thumbing through the rest of the book, I found no scenes in the town jail, so my initial guess is that the novel doesn’t have the hangover cure. Before continuing on this odyssey, some background is in order. Asafoetida (also spelled asafetida, assafetida, assafoetida; called hing in parts of Asia) is a resin collected from shrubs like Ferula foetida Regel, F. assafoetida, F. narthex, F. rubricaulis Boiss. and a few other species that are native to the Mediterranean region and Central Asia. Like many other plants (such as sugar maple or rubber trees), a wounded plant will exude sap, gum or resin. A harvester makes shallow slits in the plant’s root and later comes back to collect the resinous material that has been exuded. These days, most of it comes from Iran and Afghanistan, and primarily goes to India for culinary uses. The word asafoetida arises from the combination of aza, which is Persian for mastic resin, and foetida, which is Latin for stinking [Davidson] (names in square brackets point to the list of references at the bottom of the post). It has a strong aroma that I associate with onions, garlic, and pineapple (!). One article [G.S.] notes that it had the folkname “Devil’s Dung.” This name should not be surprising to anyone who has a container of the stuff in their spice cupboard — I always keep my container inside another container to isolate its funkiness (and have a strong memory of my mother recoiling from the aroma when we were preparing a South Indian dish). Based on the articles I found in the UC Berkeley literature collection, it is clear that asafoetida has been known as a medicinal ingredient in Western Europe and the United States for a long time — in Europe since at least the first millennium BCE; in the U.S., it had United States Pharmacopeia/National Formulary recognition from 1820 until 1960 [G.S.] and was listed as a remedy for hysteria, mania, or hypochondriasis in important medical texts published between 1733 and 1936 in Europe and the United States [Hobbs]. Asafoetida was a known medicinal ingredient in 19th century United States (and territories). It was part of a reputed cure for cholera [Haggard], fits into the category of “Home Remedies” in Texas [Mixon], and some in the Oklahoma Territory advised putting a bag of asafoetida around the neck to ward off disease [Johnson]. Based on this cursory look, it seems possible that Mississippi could have found asafoetida in a local pharmacy or doctor’s office. Might John Wayne Have Suggested Asafoetida? I’ll start with the most exciting find: an article about John Wayne and his role in the film In Old California. A 1991 article by Alice Jean Matuszak in the journal Pharmacy in History focuses on the 1942 film In Old California from Republic Pictures [Matuszak]. Set in 1848, John Wayne (in his 81st film) portrays a man from the East Coast who has a dream: become a successful pharmacist in Sacramento. There are bad guys in his way, of course, and a lot of other things going on, and I assume that Wayne steps away from the pharmacy to throw some punches and be a tough guy (I skipped over the detailed synopsis because I’ll probably watch the film sometime). Wayne’s role in this minor film warranted a journal article because it was a highly positive portrayal of a pharmacist and it was slightly biographical: Wayne’s father (Clyde Morrison) was either a pharmacist or drug clerk and Wayne worked in pharmacies when he was a student. 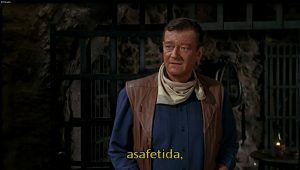 John Wayne’s real name was Marion Morrison. Early on, he got the nickname “Duke”. Born in Winterset, Iowa in 1907, the family moved to Palmdale, California in 1910 (the edge of the desert), then to Glendale in 1916 (Los Angeles County). His father worked in at least four different pharmacies while they lived in Glendale. Biographies of Duke Morrison picture him as a hard working youngster who was an honor student. He delivered newspapers before school and worked after school at the pharmacy where his father was employed. He delivered prescriptions and did other tasks for his father in the store. Among memoirs and reminiscences, one story is told about Duke and a bottle of asafetida that somehow got spilled at Glendale High School. Did Wayne recall the infamous asafoetida event while making the film? Is it possible that the cast was improvising during rehearsals for the hangover cure scene, and Wayne suggested, “How about we put in a dose of asafoetida? I remember spilling a jar of the stuff, and boy did it stink.” Or did Wayne suggest it to the screenwriter? Perhaps there is book by or about Wayne or Hawks that gives an answer. I’m not aware of any modern European cuisines using asafoetida in the kitchen, but the ingredient has been known in Europe for a long, long time, with cuneiform tablets showing that it was cultivated as long ago as 750 BCE in Babylon [Davidson]. The ancient Greeks and Romans knew about it. In ancient Rome, it was used in the kitchen, possibly as a substitute for a prized ingredient called laser, which came from a plant called silphium. The plant has been extinct since ancient Roman times, the exact identification of the plant is unknown; researchers think it is a relative of fennel. Silphium was likely hard to find or quite expensive during the early Imperial era since the famous cookbook by Apicius (De Re Coquinaria) suggests asafoetida as a replacement for laser [Parejko]. In a roundup of current medical literature from 1892, the British Medical Journal reports on the use of asafoetida in Italy to prevent miscarriage: “He follows the prescription of P. Negri, of Venice: asafoetida 6 grammes, to be made into sixty pills. Directly pregnancy is suspected, one of the pills (about a grain and a-half) should be taken twice a day; the dose is then slowly increased to ten pills daily, and then gradually reduced till confinement.” [British Medical Journal, 1892] The literature roundup also includes a creative use of a rat’s tail (see the notes section at the bottom of the post for the full item). Wood’s cure for tobacco habit – “Tobacco habit conquered in 3 days” – A series of formulations containing: phenolphthalein, quassia, aloin, and strychnine [Ed. note: !!! ]; asafoetida, iron and strychnine; methylene blue; and methyl salicylate. The contents of the table are from the second collection of a landmark publication by the British Medical Association, Secret Remedies: What they Cost and What They Contain, which aimed to detail the claims, boasts, prices and contents of many proprietary medicines [British Medical Association]. No. 304 (to be swallowed whole). — The average weight of one after removal of the coating was 4.4 grains. Analysis showed the principal constituent to be asafoetida; in addition, a minute trace of an alkaloidal substance, which was far too small in amount to be examined, but which was not strychnine, was present, and no other medicinal substance was found. Here’s something from a book published in 1822 in London, The Family Cyclopaedia; being a manual of useful and necessary knowledge, alphabetically arranged; comprising all the recent inventions, discoveries, and improvements in domestic economy, agriculture, and chemistry, etc, by James Jennings (my emphasis). This author has a rather dim opinion of the ingredient (pp. 64-65) (my emphasis). and that it is an extremely powerful remedy in the cure of chlorosis. Although we are not unwilling to admit that some good qualities belong to this drug yet we have no hesitation in saying that we believe its virtues have been considerably over rated. 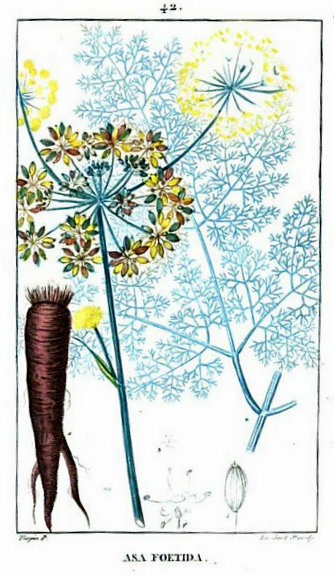 It appears to us to be very nearly allied to the onion not only in its sensible qualities but in its medicinal effects and although to some constitutions the exhibition of both asafoetida and the onion is manifestly advantageous yet we know and affirm that there are others and not a few to which the exhibition of asafoetida for months has had no good effect whatever the only sensible one has been an impregnation of the body and the clothes and bed clothes of the patient with that disgusting effluvia which belongs to asafoetida and to the onion. We make these remarks because we believe that failures from the administration of asafoetida are more frequent than medical men are willing to acknowledge and use we would not have the general reader rely upon the powers of medicines which although sometimes useful are not so generally so as they have been usually affirmed to be. We must not take for granted that because a drug has a powerful smell that it must be a powerful medicine. We believe that asafoetida and musk have both obtained considerable eminence as medicines from their intense and striking smell alone . It is remarkable that a mixture of the smells of these two drugs yields the usual smell of most druggists shops. Settlers also placed great faith in unusual practices and widely advertised patent medicines. Remedies such as tying a bag of asafetida around a child’s neck to ward off disease, or carrying buckeyes in the pocket to prevent rheumatism, belonged to the realm of pure superstition. But one of the strangest customs was the use of a madstone to remove poison from a person’s system after contact with a rabid animal. This stone, supposedly taken from the body of a white deer, was placed on the wound to absorb poison. If it continued to adhere, the victim was in danger; if it fell off, he was safe. In a 1941 issue of The Southwestern Historical Quarterly, Ruby Mixon proposes a research plan (as an outline) that can guide any group that is researching the history, culture and traditions of their local county. Sections include county geography, Indian history, pre-1890 settlements, and so forth. In section VII (“Social activities”), the JSTOR search engine found this item: “K. Home remedies–common ailments, snake bite, asafoetida, etc.” Nothing more is given, so I don’t know how asafoetida fits into the history of Texas home remedies, but its presence on this outline implies that it was well known as a home remedy in Texas. Davidson, Alan, Oxford Companion to Food, edited by Tom Jaine, consultant editor Jane Davidson, research director Helen Saberi, Oxford University Press, 2006. Parejko, Ken, Pliny the Elder’s Silphium: First Recorded Species Extinction, Conservation Biology, Vol. 17, No. 3 (Jun., 2003), pp. 925-927, JSTOR link. 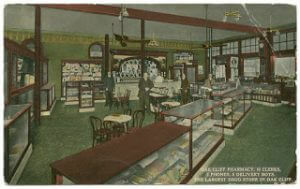 Drawing of asafoetida from Flore Médicale by Chaumeton, François-Pierre, Jean Baptist Joseph Anne César Tyrbas de Chamberet, Jean Louis Marie Poiret, Panckoucke, Paris, 1833-1835, full text at Google Books; photo of Oak Cliff Pharmacy from DeGolyer Library, Southern Methodist University, via Flickr Commons; photo of Mrs. Owens from her cook book at Google Books (link above in reference list). It's not Maudie, the main female character, who broke J.P.'s heart — they're old friends. No, it's explained by the deputy that the lady who he got involved with ran off with some other guy, which is why J.P. went to pieces and pickled himself.